A graduate of the Lagos State University, LASU, Ojo, Lagos State, Miss Tolulope who was posted to Ogun State for her national assignment has been sent packing from the orientation camp of the National Youth Service Corps, NYSC in Sagamu, Ogun State over her refusal to wear trousers at the orientation camp. Tolulope, who reported to the camp in Shagamu on Tuesday, March 5, in her khaki skirts, was said to have been shown the way out of the camp last Friday, March 8 at about 11:00pm by the Camp Co-ordinator, Franca Ifon. Tolulope said that wearing of trousers negate her Christian belief and values which she could not compromise. “Before I had the dream, I never wore trousers and even after the dream, up till now. I have not wore trousers. I explained everything to the leadership of the NYSC but they said the penalty for not wearing the khaki trousers is by being decamped. “I faced a panel and I was directed to submit all the kits that were given to me at the camp, which I did. I was also ordered to go to the accounts unit and refund the N2, 500 transportation and bicycle allowances I was paid on the camp and I did so. All these happened on the same Friday that I was ordered to leave the camp. 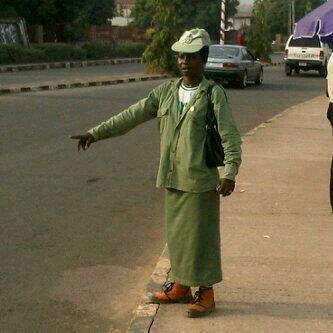 “I want to serve my father land and if NYSC will allow me to wear skirt on the camp, I am ready to return to the orientation camp. My khaki and white skirts were made in such a way that they did not give me any problem. I was in Platoon Four and I participated actively in all the exercises from Tuesday to the Friday that I was thrown out of the camp,” Tolulope said. The Head/Press and Public Relations Unit of NYSC in Ogun State, Mrs. Tarkighir Diana, confirmed Tolulope’s exit to DailyPost. She explained that Tolulope Ekundayo signed an undertaking during her registration on the camp, which she later disobeyed. Ekundayo’s church leaders, led by Apostle Paul Taiwo Adenuga of the Faith Apostolic Church, Egbeda, Lagos State have opted to pursue the matter legally.